Check it Out! War History Online proudly presents this guest blog from accomplished author and blogger Hans Wiesman. You can read more by Hans and find out about his book on his website. 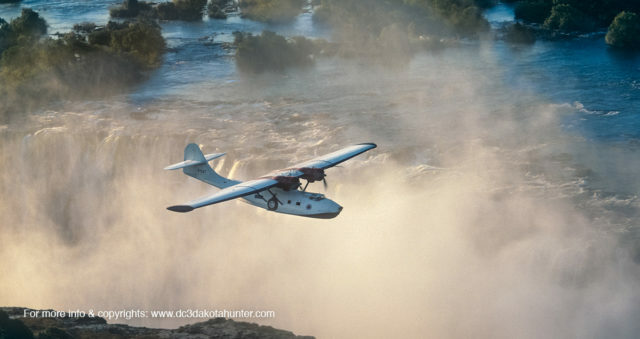 In April 2016, I wrote my first Dakota Hunter Blog `Catalina Photo Album`. That blog became overnight an overwhelming hit in the number of Shares and Likes on War History Online and Facebook. War History Online repeated the posting a few times and each time again, this Blog drew massive attention. The conclusion? The Catalina’s name is a magnet, almost a magic word for many, why is that? Is it the aircraft’s deviant silhouette with that parasol wing? Or its dual capacity as being a flying boat and a long range patrol aircraft, which gave the Catalina its unique multiple and heroic tasks in WWII and beyond? Or maybe the simple fact, that flying boats and amphibians carry a most romantic emblem from a glorious past of Travel & Aviation between the years 1935-1955? Whatever the reason, it became clear to me that my huge collection of Catalina photos that I have, would deserve a better place than being stored in boxes out of sight of anybody. I went in search of other collections and soon had a plan: making a photo album from the best of all 3000+ photos that I could find. An album in 8,5 x 11-inch landscape format as a Luxury Coffee Table Book with such awesome photos selected as rarely seen in Vintage Aviation books. The PBY Catalina was built in greater numbers (some 3.300 of all versions) than all other makes and types of flying boats and amphibians together. That simple fact reflects the reliability and versatility of the type and the worldwide interest in the aircraft that came over the years 1938-1945. The manufacturer Consolidated-Vultee (later renamed as Convair) had some initial problems with the sales since the maiden flight of the fist PBY prototype XP3Y-1 on March 21, 1935. The factory was engaged in a contest for a US Navy contract against the competition contender from the Douglas XP3D. Some serious modifications still had to be made on the prototype model, mainly in its directional control with an improved keel and rudder design. Right at that same time, Douglas rolled out the brand new DC-3 that made its maiden flight December 17, 1935. The success of that aircraft was so overwhelming, almost from scratch, that Douglas may have considered itself as the winner of the US Navy contest for a new maritime Patrol & Bomber (PB) aircraft. But Consolidated had the cheaper offer with the PBY-1 and won the order for 60 aircraft, all to be delivered in 1937, starting the production in Sept. 1936. Soon more Navy orders followed and with the War coming closer in 1938-39, Russia, England, and France stepped in for orders. The British made their order of 50 for the latest type PBY-5 with the upgraded engines Pratt & Whitney R-1830 with 1200 HP max. They started to use the name “Catalina”, which was soon adopted worldwide for the type while many of the examples license-built in Canada were known as Cansos. Australia and the Dutch East Indies Army made big orders in 1940 for the Catalina, after the War had started in Europe in September 1939. 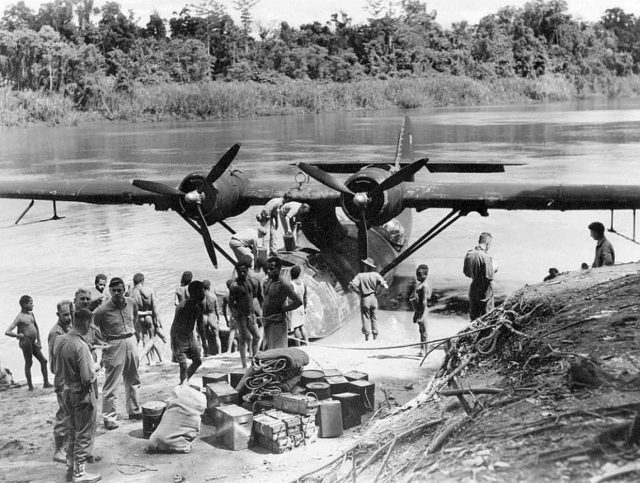 Photo above depicts a PBY-5 Black Cat, moored at a riverbank in Papua New Guinea (PNG) for refueling. A very sharp photo with amazing details. Fuel cans, ammo, and food, all loaded aboard with help of the local tribesmen. It perfectly reflects the versatility of the Catalina, the aircraft that could penetrate at night deeply into the Japanese-held territory and attack harbors, ships, U-boats, enemy facilities and drop mines for hampering shipping/ supply lines. With no Allied airfields so close to the Enemy, only the Catalina could do this trick in very primitive conditions. With hardly any basic ground facilities available, they could launch attacks from hard-to-detect rivers and lagoons. Hidden in day-time and striking at night as rogue sharks from the deep of the ocean, the Japanese hardly found an answer to the surprise night attacks of the Black Cats. Both the USAAF and the RAAF operated the Cats from Northern Australia and later PNG and Borneo for attacks on the Japanese Navy in the Philippines. For more of such fascinating wartime photos, see my book “a Tribute to the Canso/ PBY Catalina”. Major Aviation Museums as the Smithsonian Air & Space Museum in Washington, DC and the National Museum of the USAF in Dayton, OH have endorsed me to use stunning photographs in my book coming from their collections. You may never have seen such photos on a full page spread of a Coffee Table Book in the 8.5 x 11 inches format! Photo above shows the PBY Catalina in all its post-war glory, as a luxury air yacht. I hired the majestic ‘boat from Plane Sailing, Cambridge UK for the making of a “Trip of a Lifetime”. It was a transatlantic crossing with this Cat on behalf of a 8 episodes TV documentary series named the “Catalina Odyssey Transatlantic Tour“. 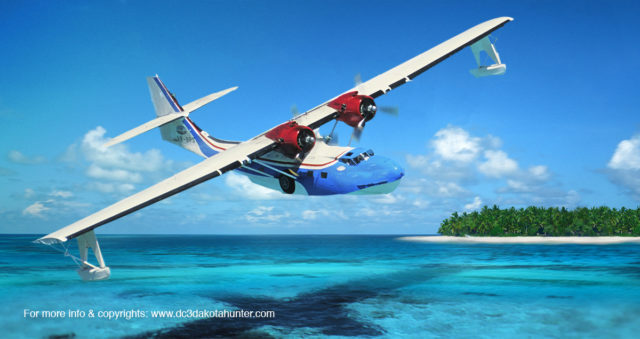 As a script writer/ creative director, I had written the scenario for this dream trip, based on my own experiences with that Catalina flying over the Borneo Jungle in the early 1950’s. I lived there as a young boy with my family, my father working for Shell as an oil exploration engineer. That Catalina Odyssey brought us from NW Europe via Gibraltar to the Cap Verde Islands. From there, we made the hop over the Atlantic to Natal, NE Brazil and continued our tour to Rio de Janeiro and La Paz in Bolivia. Lake Titicaca was on the agenda for an intended water landing on this huge stretch of water at 3800 m alt. in the Andes. Just before the touchdown on the cold waters of that mysterious lake, we entered a down draft and our Cat almost crashed in a very violent splashdown. But the very skilled Captain Paul Warren Wilson saved the situation and pulled the Cat out of its agony. Read what happened out there and how we continued our epic journey up north into the Caribbean. This photo was taken near Bimini Island as we were about to make a water landing in the Blue Lagoon. Surely in more peaceful and romantic circumstances than the situation the Inca Shaman had predicted, prior to our landing on Lake Titicaca. The Gods of the Mountains were upset by our attempt to land on the Sacred Lake, the Shaman told us. Did he put a spell on us? Whatever, we barely escaped from the Curse of the Gods. While suddenly the throttle handles were slammed forward with a full power setting on the engines, Paul screamed “Abort Landing!”. He pulled the nose up, out from the water and tried to crawl away from under that ferocious but invisible hand that tried to crush us into the lake. 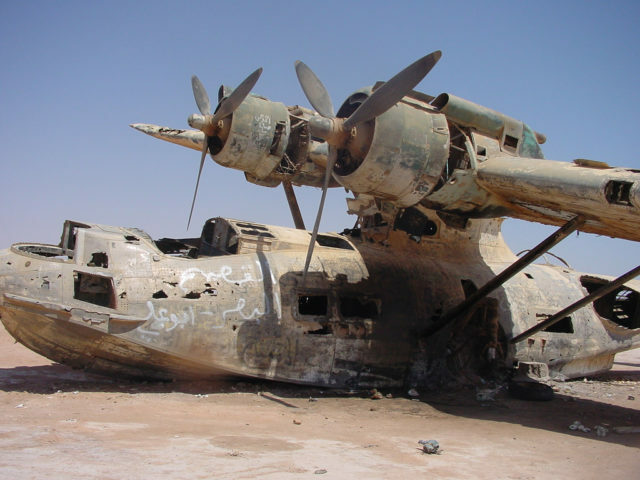 Photo above shows the sad remnants of a US registered, privately owned Catalina that was on a World Tour in 1960. With the American Family Kendall aboard, they were coming from Egypt and made a landing for the night stay on an abandoned Saudi Arabian Beach. What followed was an outright nightmare as the 12 passengers and crew were attacked by a Bedouin armed patrol, who took the plane for an Israeli Spy Aircraft. Read the horror story and see the photos taken from their unique Family Album. I received permission to publish the photos and their story from one of the Family members. The aircraft was abandoned with over 350 bullet holes and 35 years later photographed by Mr. Ken Stanford who also permitted me to use some of his photos. This is the first time that their collections open up for an illustrated story of outstanding and gallant behavior that finally saved the lives of all occupants, with 2 people seriously wounded. But they all survived and with the help of the US Ambassador went back home, their beloved Catalina was doomed. Our very first Catalina Odyssey was flown with this Cat and it would become my Motorhome for the next 8 weeks. That was no punishment, I can tell you. Z-Cat was first flown to Holland for a redecoration job in the Sponsor’s livery. The journey with 12 passengers, Pierre, 3 crew members, my sister Corine for the logistics and myself as the Tour Director was to become another epic ” Trip of a Lifetime”. With a “grandeur” like what people can only dream of. Such majestic intercontinental traveling is not for sale anymore, not at any agency I know. But we did it twice and in my book, you can see the fabulous photographs that resulted from the Catalina Odysseys. 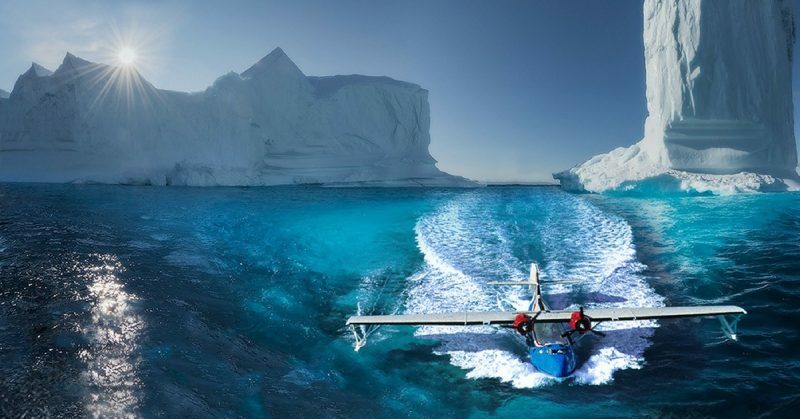 In total, twelve weeks of traveling around the Americas, in such machines with water landings at will plus four Atlantic crossings have yielded extraordinary photos. With well over 3000 images, I have selected the very best top-100 for this book. Moreover, I picked another 200 photos from other sources: the “Survivor Catalina” Operators, Military & Aviation Museums, Photographers, Collectors. Simply, the best you can ever find, now all in one book in large format. My new book “A Tribute to the Canso/ PBY CATALINA” will soon come for sale. For my WAR HISTORY ONLINE and Facebook readership, I have made on my website an Early Bird Registration form that you can fill in with your name and email. You will receive a Newsletter and a Free Bonus if you send me this, click here for the Registration Button for Newsletter, Order form and Free Bonus. Read this carefully, and as you complete the Order form later, you can earn an autographed photograph of the book’s front cover as you can see below. Frans Lemmens, Corine Quarterman, Babette Alfieri, Daniel Kordan, Ken Stanford, Hans Wiesman / The Dakota Hunter TM. With special thanks to David Legg, editor of the “Catalina News”, Peter Schutte for his all his fabulous photo upgrading/scanning and Ian Hughes for his book design work. Those specialists are working with me on this book, along with a number of Photographers, Owners of Catalinas and Museum Directors. If you think that you have outstanding photographs of a Catalina (flying, derelict, crashed or stored) in good quality and not widely published before in Social/ Mass Media, you can contact me for a submission of your images. Please send your name to me via Facebook Messenger or via the contact form on the Dakota Hunter website.